Offer valid until 30th June 2019 at participating dealers only and subject to vehicle availability. Finance provided by Nissan Finance, Rivers Office Park, Denham Way, Maple Cross, Rickmansworth, WD3 9YS. Subject to status. Guarantees and indemnities may be required. You must be at least 18 and a UK resident (excluding the Channel Islands). Terms and Conditions apply. Please refer to your local authorised Nissan dealer for further information and exact specifications. *NISSAN DEPOSIT CONTRIBUTION OF £1,400 IS ONLY AVAILABLE WHEN TAKEN ON 4.99% APR PCP NISSAN FINANCE PRODUCT AND IS ONLY AVAILABLE ON ACENTA LIMITED EDITION GRADE. Offer based on 8,000 miles pa, excess mileage 8p per mile. Offers not available in conjunction with any schemes or other offers. Vehicle price includes first registration fee and 12 months’ road fund licence. Offer valid until 30th June 2019 at participating dealers only and subject to vehicle availability. Finance provided by Nissan Finance, Rivers Office Park, Denham Way, Maple Cross, Rickmansworth, WD3 9YS. Subject to status. Guarantees and indemnities may be required. You must be at least 18 and a UK resident (excluding the Channel Islands. Terms and Conditions apply. Please refer to your local authorised Nissan dealer for further information and exact specifications. *NISSAN DEPOSIT CONTRIBUTION OF £1,900 IS ONLY AVAILABLE WHEN TAKEN ON 4.99% APR PCP NISSAN FINANCE PRODUCT AND IS ONLY AVAILABLE ON ACENTA, N-CONNECTA, N-SPORT AND TEKNA GRADES. Offer based on 8,000 miles pa, excess mileage 8p per mile. Offers not available in conjunction with any schemes or other offers. Vehicle price includes first registration fee and 12 months’ road fund licence. Offer valid until 30th June 2019 at participating dealers only and subject to vehicle availability. Finance provided by Nissan Finance, Rivers Office Park, Denham Way, Maple Cross, Rickmansworth, WD3 9YS. Subject to status. Guarantees and indemnities may be required. You must be at least 18 and a UK resident (excluding the Channel Islands). Terms and Conditions apply. Please refer to your local authorised Nissan dealer for further information and exact specifications. *NISSAN DEPOSIT CONTRIBUTION OF £3,000 IS ONLY AVAILABLE WHEN TAKEN ON 4.99% APR PCP NISSAN FINANCE PRODUCT AND IS ONLY AVAILABLE ON TEKNA GRADE. Offer based on 8,000 miles pa, excess mileage 8p per mile. Offers not available in conjunction with any schemes or other offers. Vehicle price includes first registration fee and 12 months’ road fund licence. Offer valid until 30th June 2019 at participating dealers only and subject to vehicle availability. Finance provided by Nissan Finance, Rivers Office Park, Denham Way, Maple Cross, Rickmansworth, WD3 9YS. Subject to status. Guarantees and indemnities may be required. You must be at least 18 and a UK resident (excluding the Channel Islands). Terms and Conditions apply. Please refer to your local authorised Nissan dealer for further information and exact specifications. *NISSAN DEPOSIT CONTRIBUTION OF £3,250 IS ONLY AVAILABLE WHEN TAKEN ON 4.99% APR PCP NISSAN FINANCE PRODUCT AND IS ONLY AVAILABLE ON N-CONNECTA, TEKNA AND TEKNA+ DIESEL GRADES. Offer based on 10,000 miles pa, excess mileage 8p per mile. Offers not available in conjunction with any schemes or other offers. Vehicle price includes first registration fee and 12 months’ road fund licence. Offer valid until 30th June 2019 at participating dealers only and subject to vehicle availability. Finance provided by Nissan Finance, Rivers Office Park, Denham Way, Maple Cross, Rickmansworth, WD3 9YS. Subject to status. Guarantees and indemnities may be required. You must be at least 18 and a UK resident (excluding Channel Islands). Terms and Conditions apply. Please refer to your local authorised Nissan dealer for further information and exact specifications. *NISSAN DEPOSIT CONTRIBUTION OF £1,000 INCLUDES ADDITIONAL £500 LOYALTY REWARD IS ONLY AVAILABLE WHEN TAKEN ON 5.99% APR PCP NISSAN FINANCE PRODUCT. ONLY AVAILABLE ON ACENTA, N-CONNECT & TEKNA GRADES ON 40KWH WHEN YOU PART EXCHANGE YOUR CURRENT LEAF. Offer based on 10,000 miles pa, excess mileage 10p per mile. Offers not available in conjunction with any schemes or other offers. Vehicle price includes first registration fee and 12 months’ road fund licence. Offer valid until 30th June 2019 at participating dealers only and subject to vehicle availability. Finance provided by Nissan Finance, Rivers Office Park, Denham Way, Maple Cross, Rickmansworth, WD3 9YS. Subject to status. Guarantees and indemnities may be required. You must be at least 18 and a UK resident (excluding the Channel Islands. Terms and Conditions apply. Please refer to your local authorised Nissan dealer for further information and exact specifications. *4.99% APR PCP NISSAN FINANCE PRODUCT AVAILABLE ON VISIA, ACENTA, ACENTA+ AND N-CONNECTA GRADES. Offer based on 10,000 miles pa, excess mileage 8p per mile. Offers not available in conjunction with any schemes or other offers. Vehicle price includes first registration fee and 12 months’ road fund licence. Offer valid until 30th June 2019 at participating dealers only and subject to vehicle availability. Finance provided by Nissan Finance, Rivers Office Park, Denham Way, Maple Cross, Rickmansworth, WD3 9YS. Subject to status. Guarantees and indemnities may be required. You must be at least 18 and a UK resident (excluding the Channel Islands). Terms and Conditions apply. Please refer to your local authorised Nissan dealer for further information and exact specifications. *NISSAN DEPOSIT CONTRIBUTION OF £2,500 IS ONLY AVAILABLE WHEN TAKEN ON 4.99% APR PCP NISSAN FINANCE PRODUCT AND IS ONLY AVAILABLE ON TEKNA, N-GUARD, OFF-ROADER AT32 & N-GUARD AT32 GRADES. Offer based on 10,000 miles pa, excess mileage 8p per mile. Offers not available in conjunction with any schemes or other offers. Vehicle price includes first registration fee and 12 months’ road fund licence. Offer valid until 30th June 2019 at participating dealers only and subject to vehicle availability. Finance provided by Nissan Finance, Rivers Office Park, Denham Way, Maple Cross, Rickmansworth, WD3 9YS. Subject to status. Guarantees and indemnities may be required. You must be at least 18 and a UK resident (excluding the Channel Islands). Terms and Conditions apply. Please refer to your local authorised Nissan dealer for further information and exact specifications. *NISSAN DEPOSIT CONTRIBUTION OF £3,500 IS ONLY AVAILABLE WHEN TAKEN ON 5.99% APR PCP NISSAN FINANCE PRODUCT. Offer based on 10,000 miles pa, excess mileage 8p per mile. Offers not available in conjunction with any schemes or other offers. Vehicle price includes first registration fee and 12 months’ road fund licence. Offer valid until 30th June 2019 at participating dealers only and subject to vehicle availability. Finance provided by Nissan Finance, Rivers Office Park, Denham Way, Maple Cross, Rickmansworth, WD3 9YS. Subject to status. Guarantees and indemnities may be required. You must be at least 18 and a UK resident (excluding the Channel Islands). Terms and Conditions apply. Please refer to your local authorised Nissan dealer for further information and exact specifications. *NISSAN DEPOSIT CONTRIBUTION OF £3,500 IS ONLY AVAILABLE WHEN TAKEN ON 5.99% APR PCP NISSAN FINANCE PRODUCT. Minimum deposit of 20% required. Offer based on 10,000 miles pa, excess mileage 8p per mile. Offers not available in conjunction with any schemes or other offers. Vehicle price includes first registration fee and 12 months’ road fund licence. Finance Provided by Nissan Finance, Rivers Office Park, Denham Way, Maple Cross, Rickmansworth, WD3 9YS. Guarantees and indemnities may be required. You must be a UK resident (excluding Channel Islands) and over 18. Excess Mileage 8p per mile inc. VAT. Terms and Conditions apply. Please refer to your local authorised Nissan dealer for further information and exact specifications. Offers are not available in conjunction with any other schemes or offers (unless otherwise stated) and are available on new vehicles when ordered between 1st April 2019 and 30th June 2019. Participating dealers only. 1. What is covered in your Service Plan? Service Plans cover the scheduled servicing of your vehicle at the mileage and times stated in the vehicle handbook for the duration of the Contract Period. This includes, at no additional cost to the initial Product Price, labour, and the parts, oil and fluids as detailed in the official NISSAN service schedule. The replacement of cambelts/drive belts/timing belts or tensioners are specifically excluded from this plan. Additional Replacement Costs as defined in Section 4 are not covered by the plan. The applicable number of years has been reached or at the maximum mileage, whichever comes first. Termination in accordance with Section 4.4 of these. (b) The value of Services already performed based on NISSAN's prices effective on the date of termination. • Contact your chosen NISSAN Dealer to make an appointment for the service to be completed. We recommend that you make the dealer aware at the point of booking that you wish to claim under your NISSAN Service Plan. • Having established that your plan is valid, the Dealer will complete the service. • You may be asked to sign an invoice when the work has been completed. Please note that any work not covered by this Service Plan must be authorised by you and will be charged to you by the dealer. Please be aware that claims for services are subject to audit by Nissan Motor (GB) Limited, the Rivers Office Park, Denham Way, Rickmansworth, Hertfordshire, WD3 9YS. • If the address specified in your Contract Document has changed. • If the Vehicle registration has changed or if the Vehicle is no longer registered in the United Kingdom. • In the case of sale, theft, or destruction of the Vehicle. If the Customer does not comply with these obligations, the NISSAN Dealer can demand additional information or inspection of the Vehicle before performing the service, regardless of other rights. If the Customer refuses to cooperate, NISSAN can terminate the Agreement in accordance with clause 4.4 below or applicable law. Terms to which a specific meaning is assigned retain this meaning throughout the entire document. Terms & Conditions • Contract Document is the Nissan Service Plan Certificate specifying the Contract Period, Customer, Vehicle, and Product Price. • Customer is the person or company specified in the Contract Document as the owner of the Vehicle. • Vehicle refers to the Customer’s Vehicle specified in the Contract Document. • NISSAN Dealer is an authorised NISSAN dealer and/or authorised NISSAN workshop based in the country in which the Service Plan was purchased, or in another state in the European Economic Area (EEA) or in Switzerland. • NISSAN is Nissan Motor (GB) Limited, The Rivers Office Park, Denham Way, Maple Cross, Rickmansworth, WD3 9YS. • Product Price means the Service Plan price (including VAT) specified in the Contract Document. • The Vehicle Handbook is the operating manual supplied with the Vehicle or any other document supplied to the Customer or NISSAN Dealer relating to the operation of the Vehicle. 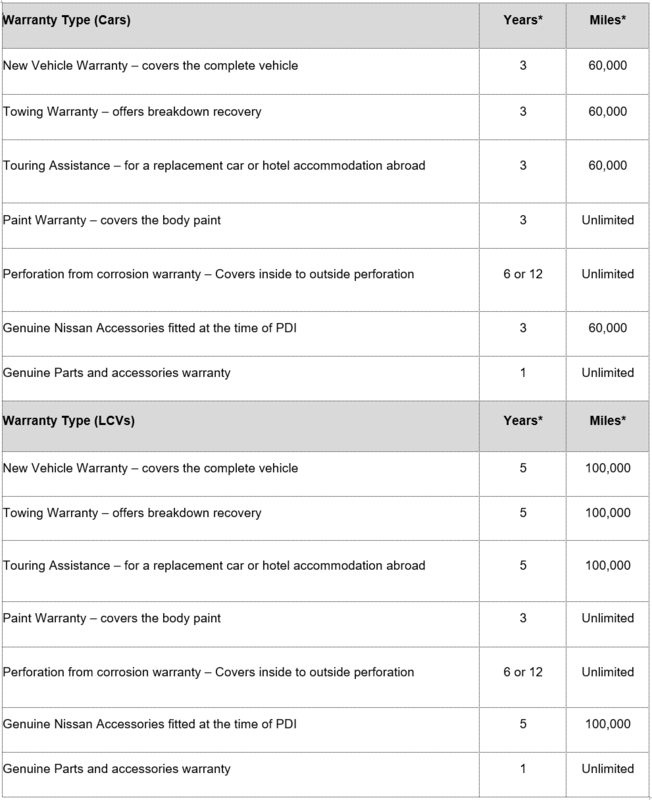 It includes the warranty certificate, servicing schedule and records. If the Customer sells the Vehicle privately, the Agreement can be transferred to the new owner. To update the details in the Contract Document, the new owner must go to the NISSAN Dealer and supply a copy of the latest MOT certificate (if applicable) and a copy of the servicing records for the Vehicle. Agreements cannot be transferred if the Vehicle is sold to or through a commercial retailer, unless expressly agreed by NISSAN. • If the other party to the Agreement is in material breach of its obligations under the Agreement. For the avoidance of doubt failure to pay the price specified in the Contract Document will constitute a material breach. • Where incorrect or insufficient information relating to the Vehicle is provided by the Customer when concluding the Agreement, if it is to be assumed that NISSAN would not have concluded the Agreement on the basis of this information. In compliance with the applicable data protection laws, NISSAN informs the Customer that NISSAN will process information that you have provided and information that it may obtain about you in the future (either directly or through any subsidiary or associated companies). Nissan may disclose this information to Nissan Group Companies, Nissan authorised motor dealers or repairers and other companies that Nissan selects from time to time. Nissan will use your data (i) to provide you with the services hereunder, (ii) to administer this agreement, (iii) to provide you with information on products and services which may be of interest to you; (iv) for the purpose of conducting market research; and (v) to provide you with agreed goods and services. Agreement, its negotiation or its subject matter, or any non-contractual obligation arising in connection with the foregoing. The invalidity of a provision in the Agreement shall not result in the invalidity of the other provisions. For further questions, please contact Nissan Customer Services on 01923 899 334 or via email at gb@nissanservices.eu. For further details please refer to the Warranty booklet and Owner’s manual provided in the vehicle or contact your local Nissan dealer. Roadside Assistance benefits and services are provided by RAC Motoring Services and/ or RAC Insurance Ltd (Registered numbers: 1424399 & 2355834, Registered office: RAC House, 1 Forest Road, Feltham, TW13 7RR). RAC Motoring Services (in respect of insurance mediation activities only) and RAC Insurance Limited are authorised and regulated by the Financial Services Authority and within the jurisdiction of the Financial Ombudsman Service and Financial Services Compensation Scheme. See Nissan Roadside Assistance welcome pack for details of breakdown and recovery services entitlement. Details of the contractual arrangements under which RAC Services are provided to you are available by calling 0870 366 5603. Authorised Nissan dealer's fitting costs vary; therefore please ask your local Nissan dealer for the exact fitted prices. The prices on this website are a guide price only and do not include any painting costs where applicable. Prices shown include VAT calculated at 20%.